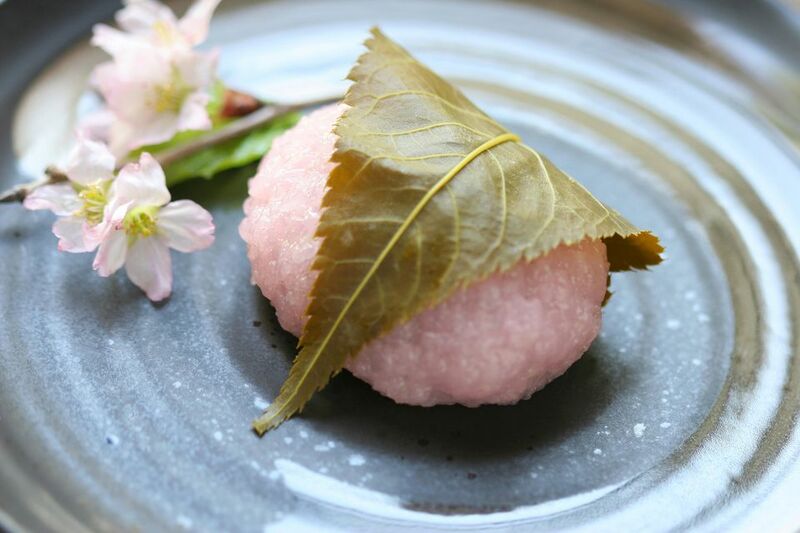 Sakura mochi is a Japanese dessert that is pink, just like the sakura (cherry blossom flowers) and is made of sweet glutinous rice and filled with a sweet red bean paste. It is wrapped in a pickled sakura leaf which is edible. Traditionally, this dessert is enjoyed during Hinamatsuri (Japanese Girls' Day) to celebrate the beginning of spring, as well as to wish good luck and good health for all of the little girls in the family. Two shortcuts can be used for making sakura mochi to minimize preparation time. First, the koshian filling can be purchased pre-made at most Japanese or Asian supermarkets. Second, pickled sakura leaf can also be purchased at most Japanese stores or even online. Sakura mochi is best eaten on the same day it is prepared. However, it may be stored in the refrigerator for up to three days and warmed in the microwave prior to eating. It is best to wrap each individual mochi securely with plastic wrap and then store them in the refrigerator. Pickled sakura leaves can be purchased at most Japanese supermarkets or online. If you are making this, do so at least 2 days in advance. Young leaves can also be used decoratively without pickling. Note: while there are multiple steps to this recipe, this sakura mochi is broken down into workable categories to help you better plan for preparation and cooking. In a large bowl, soak azuki beans in water overnight. Transfer beans to a large pot, add water and bring to a boil. Turn down the heat to medium and simmer beans for about 10 minutes. Skim foam and any residue that floats to the top of the pot. Wash rice until water runs clear and drain. Let drained rice stand for 30 minutes. Meanwhile, heat sugar with 1 cup of water in the microwave for 1 to 2 minutes to dissolve and let cool. Add 2 drops of red food coloring to the sugar mixture. This will make the rice pink. Add the pink sugar mixture to the rice. If available, use the setting on your rice cooker for "glutinous or sweet rice" and cook the rice. After the rice cooks, don't open the rice cooker and let the rice steam for 30 minutes. While the cooked rice is cooling, soak the pickled sakura leaves in water for 15 minutes to remove the salt. Drain the leaves on paper towel. Use a piece of saran wrap large enough to generously cover the palm of your hand so that the mochi doesn't stick to your hand. Take about 2 to 3 tablespoons of mochi and spread on your palm in an oblong shape about 2 1/2 inches long. Be careful not to spread the mochi too thin, because then your koshian filling will break through the mochi when you are wrapping it. Place a round 1 to 2 teaspoon scoop of koshian filling near the bottom center of your oblong mochi. Then fold over the top half of the oblong and seal it by pressing the ends of the glutinous mochi closed. Repeat until all of the mochi is made. Lastly, wrap in the sakura leaves.